Pick, wash, soak boiled rice & urad dal separately in sufficient water for about 6 to 8 hours. Soak methi seeds along with the rice. First grind the dal to a fine, light & fluffy paste & then grind the rice in the same grinder to a smooth paste, use water sparingly. Both the batters must be sufficiently thick but of pouring consistency. Pour both the batters in one sufficiently large container after grinding. You may grind the rice to a slight grainy/coarse consistency if you so prefer. Mix both the pastes either with a wooden spoon or with your hands. Add salt to taste & combine well. Cover with a lid; set aside in a warm place to rise & ferment preferably overnight. The batter should be well fermented & risen. Heat a deep steamer with about 3-4 inches of water or according to the depth of your steamer. Make sure that the idli plate/mould does not touch the water. Replenish the water when the level reduces. Let the water boil & then place the batter filled idli moulds. Lightly grease the idli moulds with cooking oil. Do not stir the batter. You need to retain the porous form as much as you can. Lift the batter gently using a deep spoon & carefully pour in the moulds. Pour just one ladle in each depression. Do not over fill the idli moulds. Gently place it in the steamer & close the lid. Steam in an idli steamer or in a pressure cooker without the whistle in batches for 7 to 10 mins. till the idlis are firm. Scoop out the idli with a spatula after it has cooled down slightly. Serve hot with your favorite chutney & sambhar. Note : Please look forward to the post of Chutney for Idli..
You may use a combination of one part boiled rice & one part normal/idli rice with one part urad dal. If the weather is cold & chilly then place the container in a conventional oven with the light on. Alternatively, place the vessel in another larger vessel & keep it in a warm place. You may even tie up the vessel with a warm cloth/flannel/blanket to help fermentation. Fermentation plays a very important role to get the right texture & form of the idli. The fermented batter requires gentle handling. 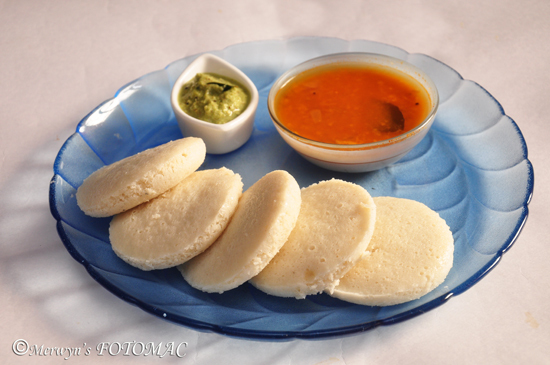 A well fermented, risen & porous batter makes the idli light, fluffy, soft & spongy.